I am Roberto Colombari from Cuneo in Italy, living in Brazil, and I'm a 35 years old telecommunication engineer, graduating at Politecnico of Turin more than 10 years ago. Immediately after having completed my studies, I started working as a researcher in the Italian national television agency which was directly collaborating with the University. This was an excellent experience which gave me the opportunity of refining and getting really into the practice of most of the topics I have been studying during the graduation. After a year spent as a researcher, I received a great proposal from Accenture which actually is one the biggest players among the consulting companies. A very difficult choice in a totally different field of action but at the end of the story I decided to give a big steering to my life and accept the challenge and here we are. I have spent nearly the next 9 years in consulting companies and nowadays I am deployed on several SAP projects here in Brazil for Techedge, which is a big consulting player in Italy. I am married and I have 2 lovely children, 3 years and a half and 2 years, who make the life a big challenge every day. It did not take too much time from the first approach to astronomy and astrophotography. The very first times I started thinking to the sky has been approximately 3 and a half years ago. It was May 2010 and I was at the client side here in Brazil, Belo Horizonte: the sky was so clear when getting out of the work every day with a very bright Venus that I have been really impressed. So, firstly, I bought a Celestron 4GT just for visual observations and some Webcam shots of planets and then, at the end of 2011, I made the big leap and bought a deep sky equipment and started capturing the sky. What I really love is wide fields while, on the other side, I am not too much into long focal lengths, but never say never! The main location from which I make my session, besides iTelescope, is my countryside property 150km from Belo Horizonte in the southern sky which has indeed unique and fantastic beauties! In my opinion having a wife and very young children actually does not sit too well with an assiduous hobby like astrophotography unless you live in a location in which you have the chance to install a fixed setup. But this is not my case, unfortunately! Taking all the equipment and moving 150km far away every Saturday or Sunday requires approximately 7/8 hours for an overall session of just a couple of hours. And what about if it gets cloudy or if issues occur? In addition, here in the south of Brazil, the raining season is pretty well defined: 6/7 months of clouds and rain from September to March, seemingly constant rain. iTelescope gave me the great opportunity of continuing what I like to do without impacting too much with my private life and work stuff! Since September 2013, when I registered into the site, I have been pretty active in producing images using iTelescope facilities. As written above, I love wide fields so my favourite scopes are T14, T20, T12 and sometimes T16. The first work I did with iTelescope has been M33 with T16, in early September. I was really at the beginning in all senses: first time on iTelescope and first time with CCD, in my own set up I use a DSLR. 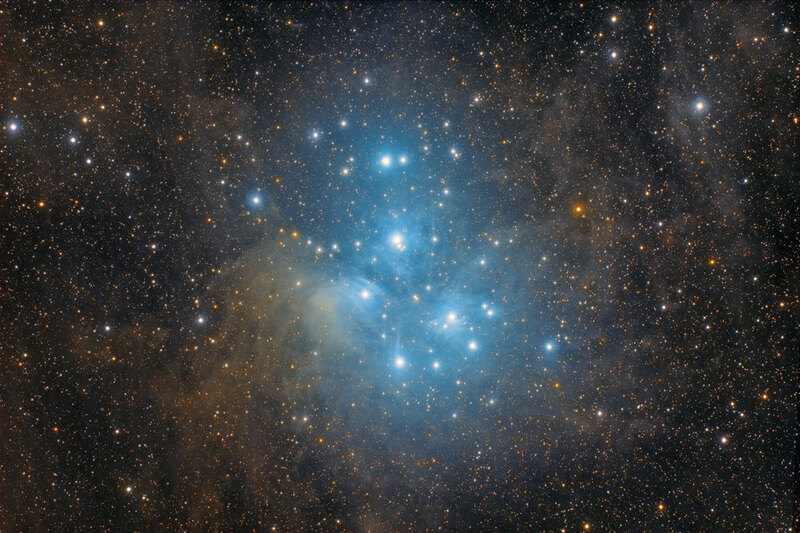 My third work with iTelescope, the Pleiades done with T14, won unexpectedly a NASA APOD. I was so excited that I couldn't believe it! 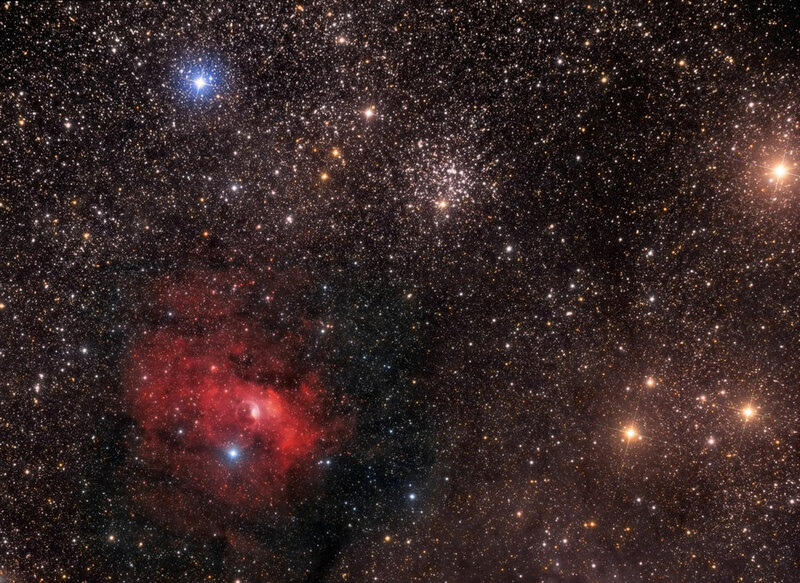 Also my fifth work, Bubble and M52 with T16, won yet another APOD! In these last 6/7 days, I have been working hard over a pretty nice field of view with my friend Federico using iTelescope: Orion and IC434 with T20 and T12. We are nearly finished, with just some close ups on the horse head and flame with the larger iTelescopes yet to be captured!